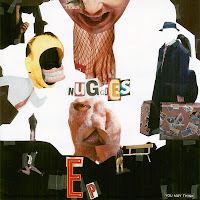 Nuggies are a Noise Rock/Electornica/Post-Music band from Brooklyn, NY and Burlington, VT. Currently based in Burlington, VT the band has achieved much critical acclaim in their short time period making music together. Started in January of 2009, avant-garde musicians and artists, Eli Lederman, Matt Michaels and Matt Selsky have come together to create a new sound to challenge the way we think about music, sounds and the way we percieve reality. The trio Self-Released their debut EP on February 10th, and has since been noticed as a landmark of 2009, and many have cited Nuggies as a band to follow closely in 2009. The band is finishing the touches on their debut album Native American President which is slated for release for Spring 2009.